Contact sheet template is a piece of developed negative photos that are lined up to be chosen for display or for further development. It is also called in photography term as index sheet, as common as it may sound but it is only in photography that this term is used. 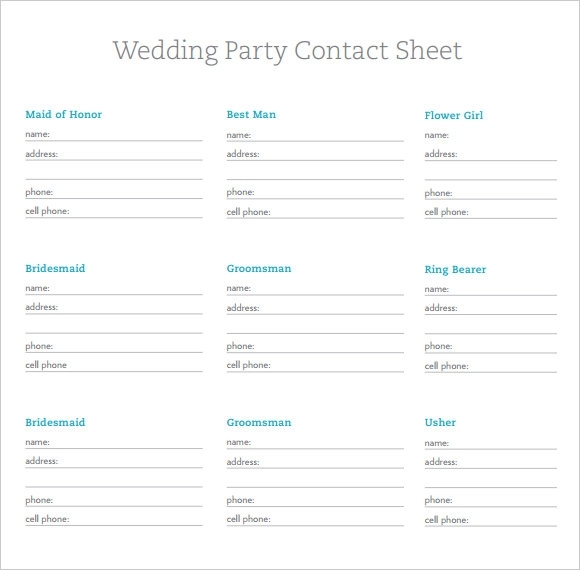 Contact List It is a thumbnail size photos that is set to photographers or clients that will choose the best shots in the lineup of all the photos taken. By having the spotlight on the contact sheet, the photographers and clients will have the opportunity to have a better view and editing process of all the images taken. 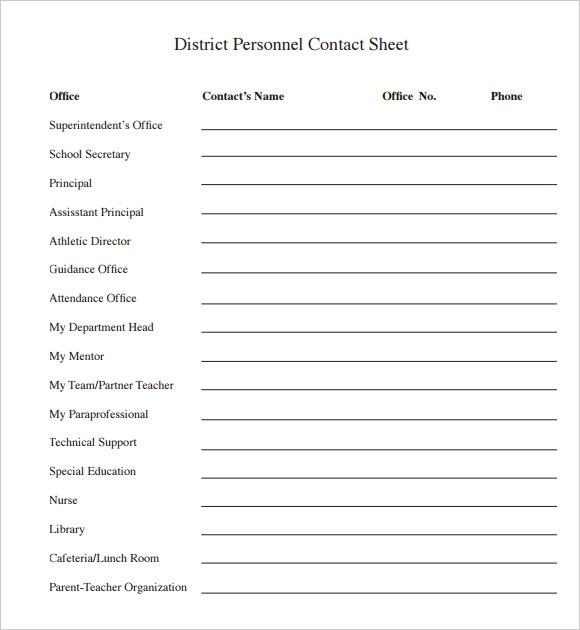 This sample of personal contact sheet contains all the important contact numbers of prominent people in the district level administration. The list has four different column and subhead. The first one specifies the designation. The second one is dedicated for the name section, while the third and forth section has is meant for writing down the phone numbers of his office and residence simultaneously. 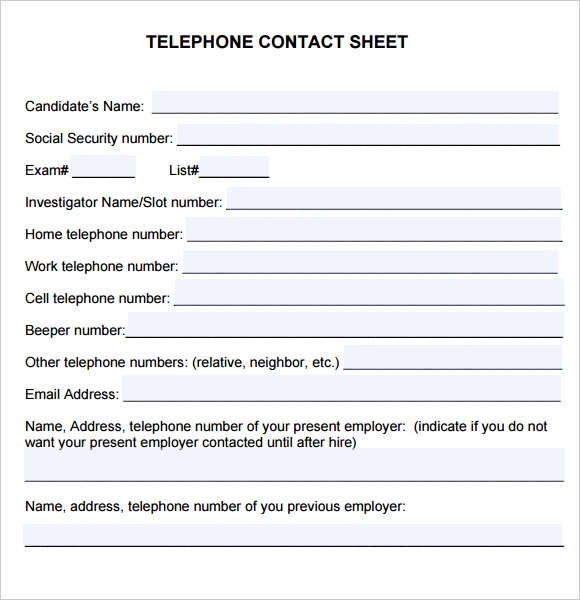 This sample contact list sheet is a contact list which is meant to be used by prospective employers to gather all the contact information of the candidate, including the number of their social security numbers, home and work telephone numbers, numbers of his relatives and that of his previous employers. This sample of volunteer contact sheet is meant for keeping a track of all the contact numbers of all the volunteers who have agreed to come for a charitable cause. The sheet begins with the detailed address of the candidate including his professional and educational profile. 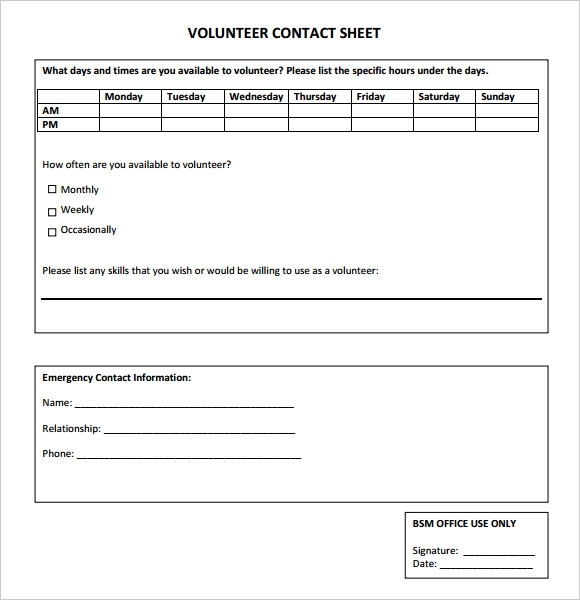 This section is followed by tab where 7 days of the week is listed and the volunteer needs to tick the corresponding boxes depending upon his availability. He should also specify, whether he intends to be a weekly, monthly or yearly member of the organization. In a huge occasion like a weeding having a contact list can be very handy, this sample of weeding contact list lists down the name, address and contact number of all the important people without whom the ceremony cannot be successful. Names include that of the bridesmaid’s, readers, usher and Groomsman. What Is The Importance Of A Contact Sheet? A Contact Sheet is a sheet where all the important phone numbers are written down for quick reference. A contact sheet can help you to create important leads in business and follow up with clients and contacts. The more leads you get, the better would be your chances of making the cut in the business. How to Manage Your Contact List in Excel? 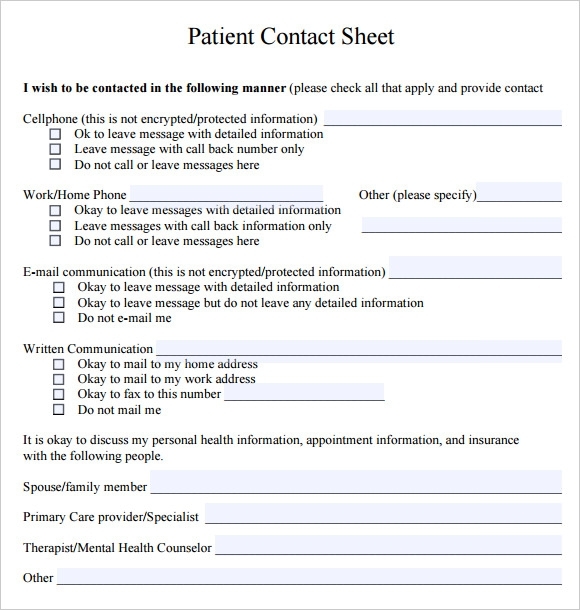 Having a contact list on a spreadsheet document is much more desirable than a handwritten one. It is easy to locate, edit and share with concerned people. In order to create a spreadsheet document dedicate the top row for creating certain columns dedicated to various fields like first name, last name, email address, phone number, company name, website URL, position, address, city, state and zip code. Once the columns are created you can easily feed in the relevant information, expand, share or edit your list in a hassle free manner. 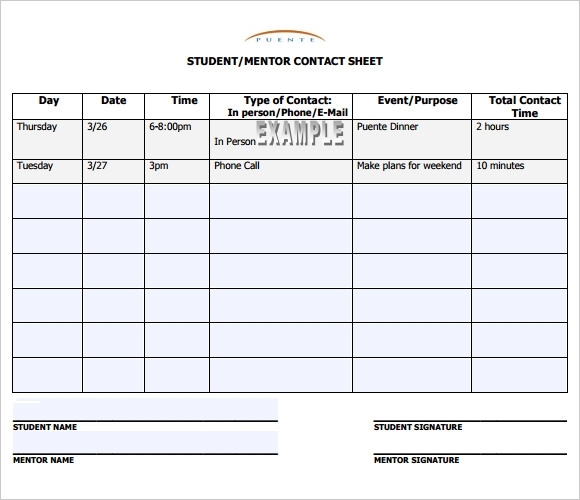 How Can You Organize Your Contacts From Various Mediums? In the days of social networking and internet important contacts tend to appear everywhere. If you are planning to import your online contacts to your offline desktop, a good way to do that would be to download the CSV file or use the import contact option on social networking sites. For importing contacts from phone or other devices use authorized software provided by the company or downloads one from the internet which has good rating. Having a contact list and arranging all your contact information is vital for the success of business. Our wide range of contact sheet samples can help you to design a customize contact sheet to suit your diverse needs.